Adult mites are white to light tan in colour, they are difficult to see with the naked eye as they only measure 0.5mm in length and the developmental stages are smaller. The body of the mite is oval shaped and cover with fine striations. There are five stages in the life cycle of a dust mite; from the egg, the larvae stage, two nymphal stages and finally the adult. The whole life cycle from egg to adult takes approximately one month to complete. Mature female mites can lay from one to two eggs per day. Adult mites can live up to two months but this is dependent on the levels of humidity and temperature of their surrounding environment. 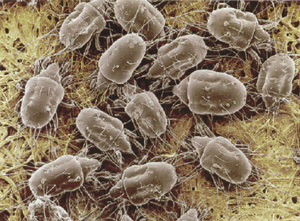 Dust mites live in the fine layer of minute dust particles that continually settles on household items. They favour homes with high humidity levels and constant warm temperatures. Mites are known to concentrate on certain furniture items, especially beds, upholstered lounges, chairs and in carpets with long fibres. They are attracted to these areas for food and they feed on shed human skin scales and secretions, house dust, fungal spores, pollen grains, plant fibres and insect scales. Dust mites dislike strong light and will take harbourage in the seams, ledges and framework of furniture when exposed. House dust mites have been known to be associated with allergies since the 1960’s and have become a recent focus over recent years for their involvement with respiratory ailments, particularly asthma. They do not bite, sting or transmit diseases, but harbour strong allergens in their bodies as well as in their secretions, excreta and shed skins. Constant contact with these allergens can trigger respiratory and dermatological complaints, which may include allergic rhinitis, childhood eczema and various other allergies as well as asthma. It is estimated that around 70-80% of people in warmer climates have an allergy to dust mites.